Vista - How much RAM? Occasionally, you see on YouTube, the comments from people who have just seen Beryl for the first time and they think that it is a Windows plug-in that runs on XP. However, the bad news for Windows users is that it is not - it is a windows manager that runs over X-Windows on UNIX systems such as Solaris, BSD, Linux and so on. On a UNIX-like system, you have the OS, then the next layer above has the graphics server (X-Windows in this case) and then you have the window manager (the bits that go around the edges of windows such as the title bars and the edges) and the contents of the windows. On MS Windows, the distinction between them is not so obvious. If you lose any part of the GUI, you usually lose the OS as well. On a UNIX-like system, you just restart the windows manager or X Windows. However, it is not all bad news for Windows users. 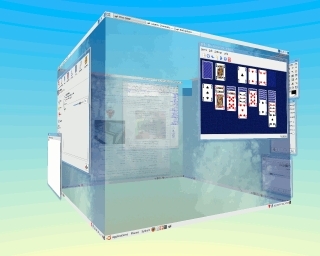 There are some 3D cube-style plug-ins for Windows (these are plug-ins) and the one featured in the screenshot is "Yod'm 3D". It works similarly to Beryl - you can configure the shortcut keys in a similar way - but because it runs as a different layer to the Aero interface, as opposed to instead of it, it is rather sluggish in some instances (this is on the same machine that runs Beryl smoothly). 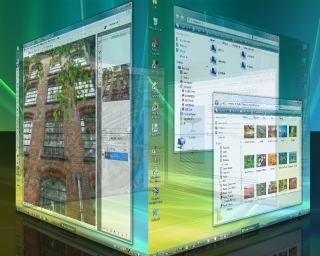 However, if multiple desktop organisation on Windows is your aim, this is just what you need. At the moment, it is free (there are plenty of mirrors listed on Google) but OTAKU software has taken it over and the new version, called 'DeskSpace', will lighten your wallet. One advantage of this program is that it is a stand-alone that does not need to be installed - you just run it from the directory you expanded the .ZIP file into. There are others - 'cube desktop' (http://www.cubedesktop.com/) for example - use the one you feel happiest with. People were shocked when they found out just how much RAM was recommended to run Vista (as opposed to XP) but just how much RAM does Vista need in order just to run itself? Reports do vary somewhat. Taking a basic installation of a 64-bit copy of Vista, I booted it up on a machine with 2GB of RAM and ran Task Manager ([Ctrl][Alt][Del] and select Task Manager from the list) to see what it did. With an uptime of around 2 minutes - just long enough to boot up and log on - it had consumed just over 700MB of RAM. After a further ten minutes or so, it had fallen to 600MB (remember that it uses a page file to dump parts of memory that haven't been used for a while). However, opening up a few programs soon pushed it above the 700MB mark again. Just how much memory you need depends upon the programs you run and even different programs that do the same job can take up different amounts of RAM according to how they are written. Image editors are one example of programs that can take up a lot of memory but how much? Each editor then had the same image - a jpeg image from a 4M pixel camera - loaded by dragging and dropping it onto the editor. In Paintshop Pro, it averaged around 27MB but in The GIMP and Photoshop, it was around 34MB. Editing adds to these figures but the extent to which this occurs depends upon the options you have chosen for backtracking your errors with any particular package. So, with Vista, you can just about get away with 1GB but you would be advised to have 2GB. If you do decide to increase the amount of RAM, one problem you might encounter is that many manufacturers will fill all of the slots on your mother board with cheaper RAM so if you have 1GB and two slots, you will probably find two, half GB sticks. If you want to have 2GB in total, you will end up buying two, one GB sticks. If you want to load a flat text file such as plain text, HTML, XML, SGML and so on, from a server, you can do it directly into the text editor itself. The screenshot shows Notepad running on Windows Vista but the same applies with text editors running under various flavours of UNIX as well. If you are running the KDE window manager, you have the luxury of many different kioslaves to do the work as well. All you need to do is click on 'File', 'Open' and then type in the protocol ('http://', 'ftp://', 'smb://') along with the rest of the URI, exactly the same as you would in a browser address bar. In the screenshot, you can see the BBC's site's robots.txt file - this tells spiders where not to look. The only difference you might find between doing this on Windows and UNIX is that often, web files are stored in UNIX format which NotePad does not understand - you end up with a single line of text instead of separate lines. Remember though that one thing you cannot do - unless you have the appropriate rights - is save the files back to the server that supplied the file. If you have a half-decent firewall, you will get emails telling you about IP-Spoof attacks from certain MAC addresses (such as the one on the right). The MAC address (six hexadecimal pairs identifying the Network Interface Card or 'NIC') is only really of any importance if you have access to the same physical subnet as that interface (which is why it is important with IP spoofing). Network communications rely upon MAC addresses being unique and they appear to be random. However, that is not the case at all. The first six nybbles (a nybble is: 4 bits; half a byte; or, a hex digit. Also note that 'nybble' can also be spelled 'nibble') of the MAC address (the 'Organizationally Unique Identifier' or 'OUI') identifies the organisation that produced the NIC. These are large organisations that produce thousands such as Xerox and Cisco ('00-03-FD-' amongst others). However, not every producer needs such a large address block. The smaller companies have a special block called an 'Individual Address Block' or 'IAB' which allows up to 4096 devices. These start off with six nybbles ('00-50-C2-') and then the assigned range, for example, Microsoft's IAB range is '00-50-C2-00-30-00' to '00-50-C2-00-3F-FF'. You can use a MAC address to identify the manufacturer by typing it into http://standards.ieee.org/regauth/oui/index.shtml . Remember that if it starts off with '00-50-C2-', it is an IAB. this is because ifconfig requires privileges as it is a powerful command that can affect other system users. We all know that you can create PDF documents directly from all of the best word processors but this seems to be a bit of a one-way journey. Suppose you have exported your file to PDF and then your machine has crashed or there is some other reason why you only have a PDF version and no version that your word processor can import. This task isn't as difficult as you might expect it to be. On Linux, there is a utility called 'ps2ascii' that uses the Ghostscript (PostScript and PDF language interpreter and previewer) engine. It will convert PostScript ('.PS') or Portable Document Format ('.PDF') files into ASCII. It ignores formatting so, as you can see in the screenshot, the tiny text - 'This is small text...' - is converted just the same as the larger text. All you need to do is pass the name of the PDF file to the program and it will output the text as ASCII to STDOUT - usually the console. If you specify the name of a text file, it will save it as that. With a lot of PDF files, you could easily write a shell or Perl script that globs the relevant file names and then saves each file's ASCII content as a separate file with the same name but with the '.TXT' extension, ready to parse and catalogue. You might find that that wireless router you've just bought only uses a 26-hex character code for encryption. Whilst you can type in a hex number for it, it is not always that obvious how you should do it on the computer. The 26 hex-character code is for WEP - you should use something stronger if you can get it but there are still many routers around that only have WEP which is better than nothing. In your system tray, you should see the wireless connections icon. Click on that and the Wireless Network Connection dialogue box opens. Click on the 'Change advanced settings' link in the 'Related Tasks' box and the 'Wireless Network Connections Properties' dialogue box opens. Click on the 'Wireless Networks' tab. Make sure that the 'Use Windows to configure ... settings' box is checked and click on your router's network name. In the properties dialogue that appears, choose 'Open' or 'Shared' for network authentication and 'WEP' for data encryption. Enter the 'Network key' and confirm it. The key index should be set to the same as the one on your router when you entered the key there. Click on 'OK' and you should be able to join your network now. If you have a number of computers to input WEP keys for, don't want to do anything other than type them in manually (most secure) but don't want to write them down (even more secure) there are ways of producing keys that you can remember. However, you must also remember that by doing so, you can make them a little less secure because they become vulnerable to a modified dictionary attack. Still, here is how to do it if you are interested in trying it out, or are morbidly curious. Hex digits represent nybbles so, for a 104-bit WEP key, we need 26 values between '0' and 'F'. Choosing randomly produces fairly secure keys but you need to write them down if typing them in manually - pieces of paper get lost or copied. So, how can we make 26 nibbles more memorable? One solution uses words from existing letters and substitutions - look at the Perl program by clicking here (both a UNIX version and a Windows (.PL) version, together with a dictionary from words consisting of the letters 'oizwhysglpabcdef' that you can play around with. All good operating systems come with Perl by default. For the rest, you can get it from 'ActiveState'). Hex uses the letters 'a' to 'f' which is rather limiting - 77 words including some dodgy ones. If we substitute numbers with letters, we can go further. Using a '1' as an 'i' and a '0' as an 'o' gives 264 words and, adding a '2' and a '5' as a 'z' and an 's' gives us 871 words. A '6' looks a little like a 'G' giving 1,185 words but there are still gaps. If you type '71077345' into a calculator and invert it (when I did my A-Levels we were about the first year that were allowed to use calculators - no memory or even a per cent button), you get 'SHELLOIL' so we'll use a '7' and a '4' as an 'L' and a 'h' (optionally a 'y'), giving us 3,757 words from which we can make sentences such as; 'diseased dodo seizes cafe food' which translates to 'd15ea5edd0d05e12e5cafef00d'. Rotating '3' gives a 'w' (we already have an 'E' so making that from a '3' is redundant) and mirroring '9' produces a 'P' giving 6,188 words, leaving just '8' unused - make up your own. There are no fixed substitution rules. However, remember your security and the simple rule 'big polysyllables disallowed' or 'b1690745477ab7e5d15a77o3ed' because it makes it too easy to crack. Using words that are too long allows for dictionary attacks on your keys (instead of gazillions of unrelated hex character combinations to choose from (taking many times the life of the Universe to break), they have a relatively extremely limited selection of words to choose from). which, as you can see, is 1/361,258,204th of the strength.